Support your community and challenge your co-workers, friends and family to some 'healthy' competition by registering your team! A Marathon Relay team can have up to 8 participants. Teams are responsible for organizing which person will cover each leg of the marathon relay and ensuring that people are at the Relay Exchange locations. Transportation to the Relay Exchange locations will be the responsibility of the Team. There is parking available at all of the Relay Exchange locations (see below). The marathon relay starts at 7:55 AM. The Relay Teams must pick up their race kit the day at the Race Expo on the Saturday. The race kit will include 8 numbered bibs and one timing chip. This event is chip timed and all Relay Teams will be assigned one timing chip that will be secured by a provided ankle bracelet. Relay start time is 7:55 am. The 1st runner that starts the first leg of the marathon relay must wear the ankle bracelet timing chip and cross the start line timing mat. 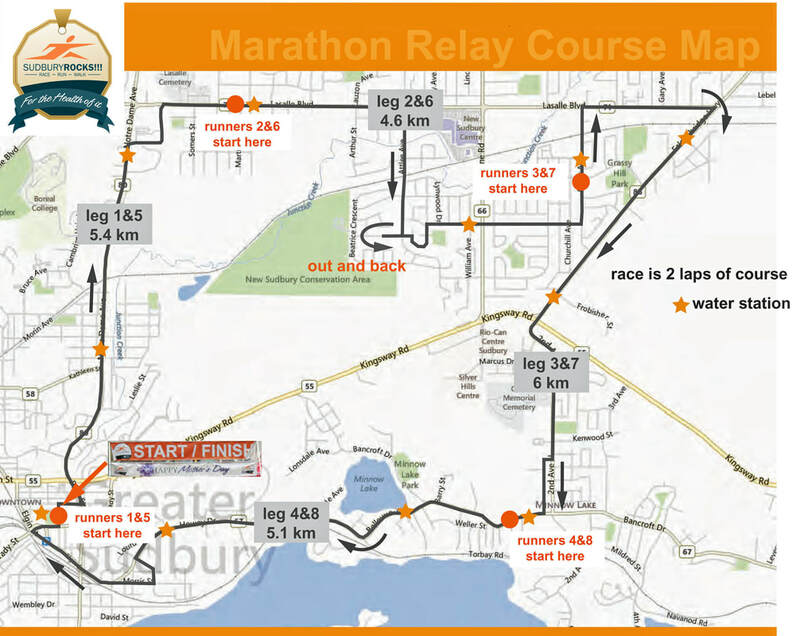 The 1st person in the relay team will cover the first 5.4 Km of the race course to the first Relay Exchange station where they will be directed to cross over a timing mat that will record their time. The ankle bracelet timing chip must then be handed over to the 2nd runner who will put on the same ankle bracelet timing chip and run to the next Relay Exchange station. The 2nd runner will again cross over a timing mat and then hand off the timing chip to the next waiting relay team member. This process will continue until all 8 legs of the relay race are covered and the last person in the team crosses the finish line timing mat that records the total team time. The timing chip will be recovered at the Finish Line. The final relay team member crossing the finish line will receive all 8 finishing medals for the team.